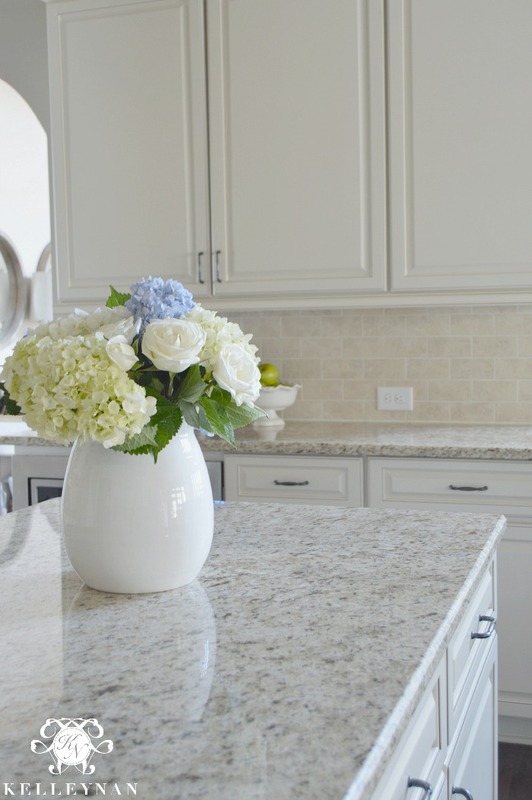 I have already started sharing some of my transitional spring spaces such as my living room and my dining room, but when Kathleen at Lindsay Hill Interiors invited me to participate in her One Room Spring Tour, I was thrilled to have the opportunity to share the subtle signs of the season in my kitchen. 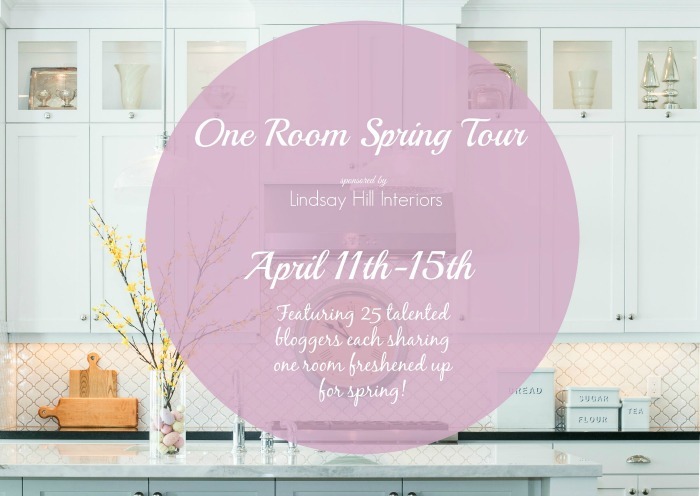 This week, 25 bloggers will be sharing their spring spaces – one room per day, five bloggers each day. The schedule is at the bottom of this post so you won’t miss a room. If you are joining me from Marg and Liz over at Fancy Farm Girls, welcome and I hope you will visit again 🙂 I absolutely love how those girls can personalize and beautify second hand pieces! 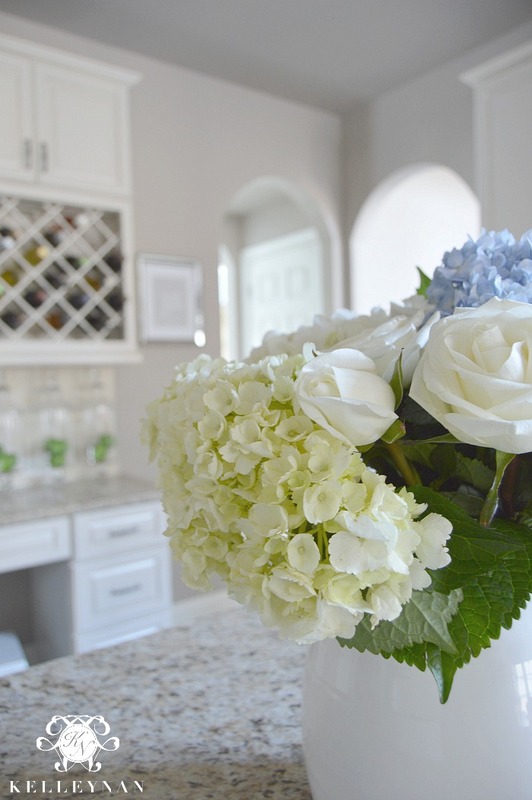 So, now that you’re here and we have literally talked about the weather, let’s move on to how I’m celebrating spring in our most used room, the kitchen. 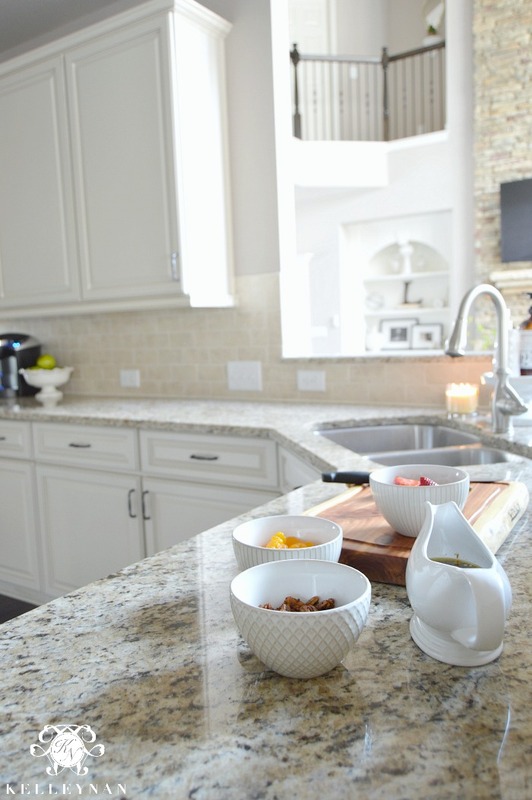 If you follow me on Instagram or have seen my previous kitchen tour post HERE, you know that more than any room in our home, I prefer to keep our kitchen decor minimal and our counter tops free of clutter. 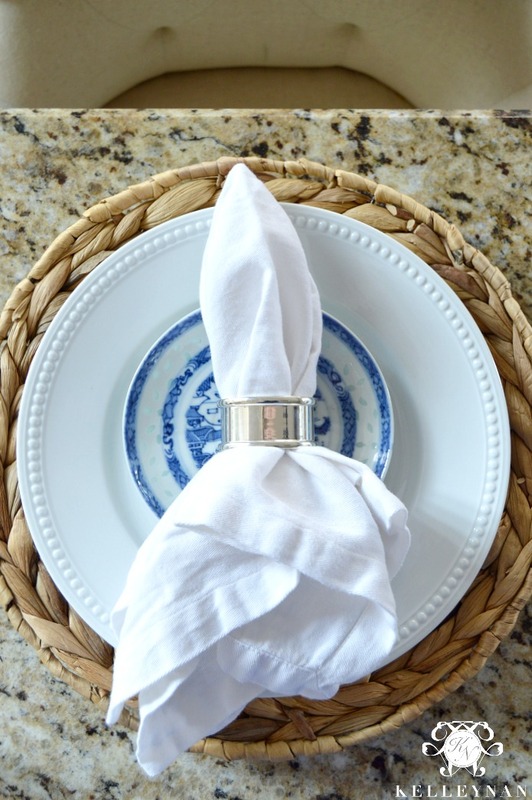 Because we eat at our kitchen bar 99% of the time, I have enjoyed setting simple, casual place settings. 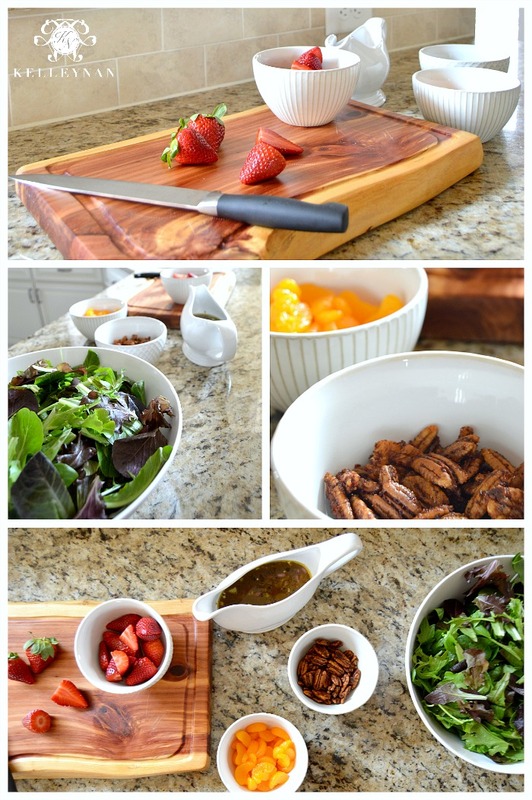 I will also be sharing how to whip up these sweet and spicy pecans; perfect for a salad or to keep on hand as a snack. I have been going for a lot of soft, cool tones with subtle pops of lime green this season. 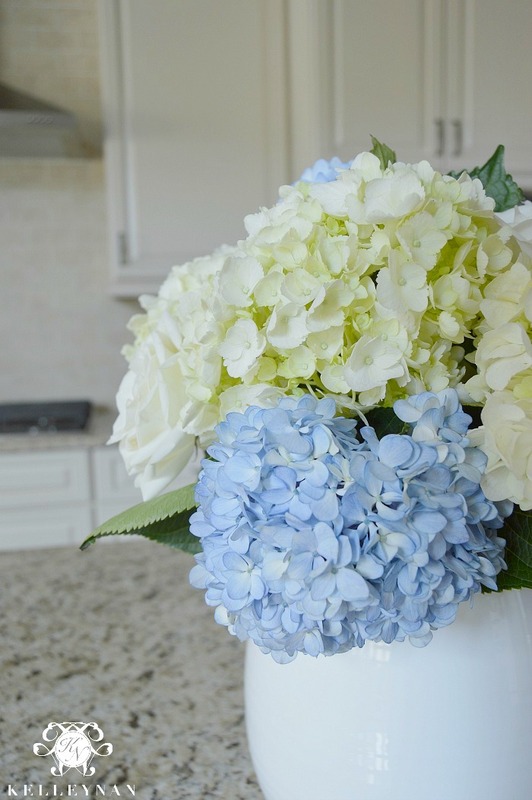 While I use hydrangeas and roses year-round, the blue-white color combo makes my kitchen feel bright and fresh. 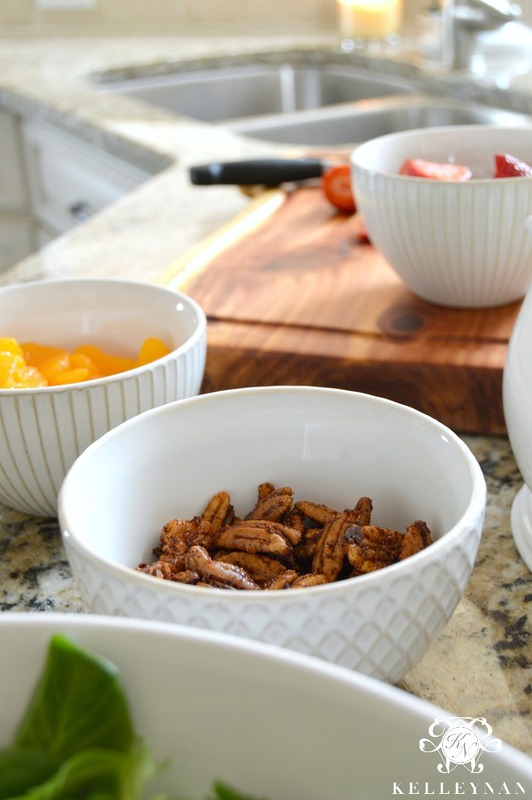 The beautiful thing about incorporating seasonal touches in your kitchen, is that you can accomplish a whole new look simply by stopping by your grocery store. You can purchase the prettiest florals and fruit that are in season, display them, and voila! You are set. 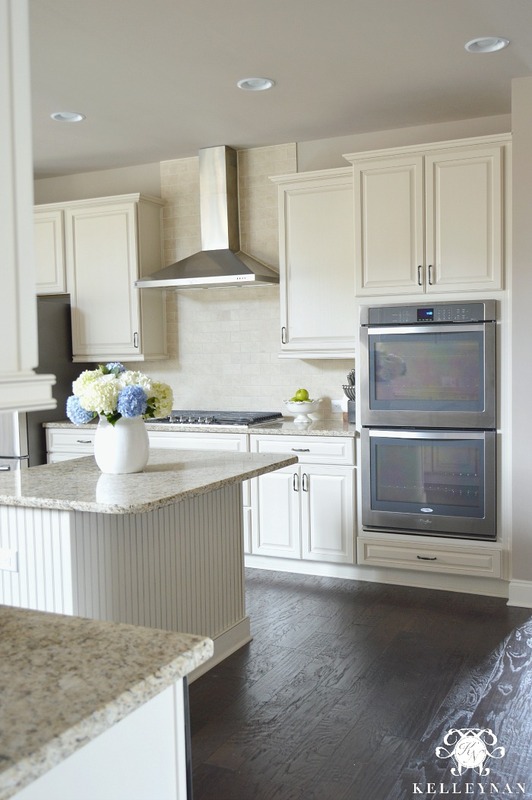 With a kitchen that has a neutral backdrop, it is super easy to switch up colors for seasons, gatherings, or just a change in mood. I depend on my island as the central space where most of the changes takes place. Those pops of green I talked about? While I do display fresh fruit also, I have been on a big faux fruit kick for the last several months. Apples, limes, and pears have been making appearances all over my home and I’m pretty sure that trend will continue. Between my butler’s pantry, kitchen, and dining room, I like to create seasonal beverage stations, such as this hot cocoa bar I created on a tray table for winter (HERE). I am always on the lookout for fun accessories like colored, patterned straws and paper snack cups. The Target Dollar Spot, Michaels, and World Market are all great sources for cute beverage accessories. Ok, ok, so I am getting to the best part- the food! As a note, the homemade dressing and pecans are both delicious on their own. Even my husband who will usually choose Ranch dressing over a house/vinaigrette dressing can’t get enough of this. Place greens in a bowl and top with oranges and strawberries. Sprinkle with blue cheese and pecans. Toss with balsamic vinaigrette. Preheat over to 350°. Stir together 1/4 cup sugar and warm water until dissolved. Add pecans and soak 10 minutes. Drain and discard syrup. Combine 2 Tbsp. sugar, chili powder, and red pepper. Add pecans, tossing to coat. Place pecans on greased cookie sheet. Bake at 350° for 10 minutes or until golden brown, stirring after 5 minutes. Whisk together ingredients except the olive oil. Gradually add olive oil in a slow, steady stream. Whisk continually until blended. Thank you for stopping by my kitchen for a little tour and hopefully, a new fresh recipe you can try soon! If you missed any of the other inspiring rooms on the tour, check out the schedule below to see catch up on what you missed and what will be coming tomorrow! Kathleen, thank you so much and thank you for having me! I absolutely loved doing this with you! I am DEFINITELY trying that salad – it has all of my favorite salad stuffers 🙂 And as always, your kitchen is fabulous. 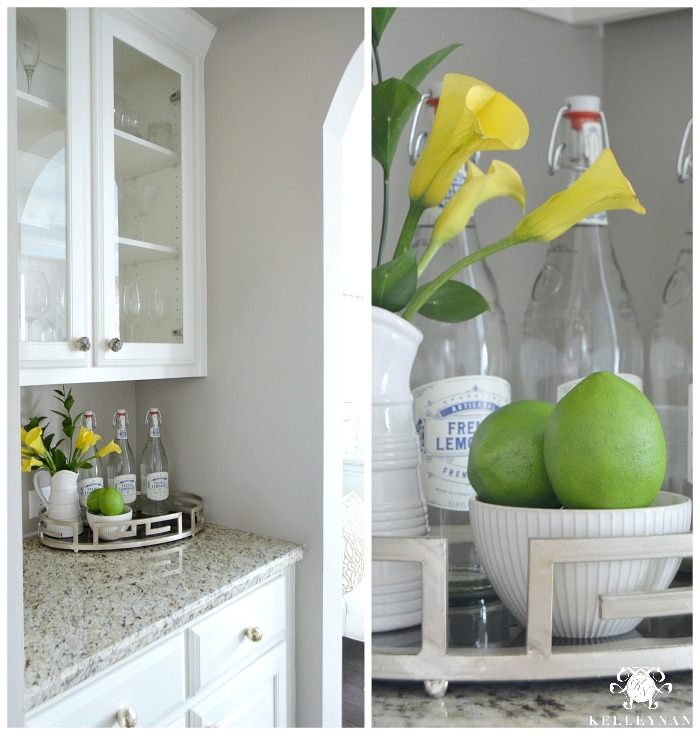 I’m loving that simple spring beverage station with the lemons and limes! 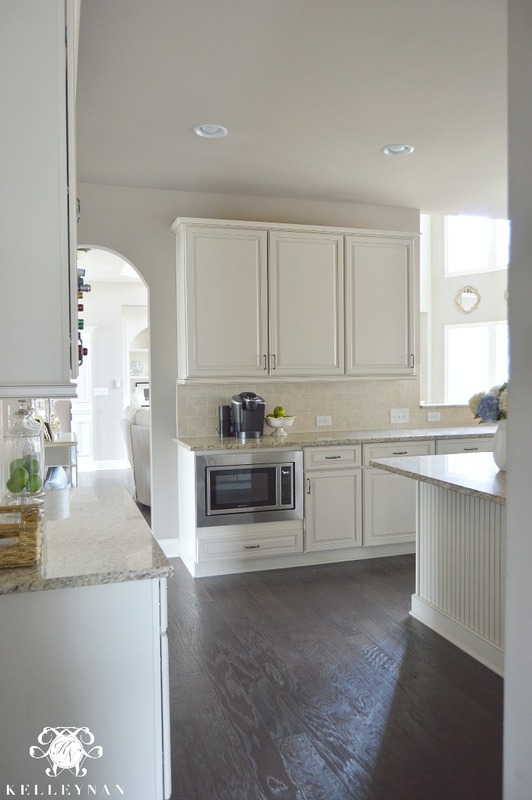 It’s always a treat to get a peek into your home Kelley! 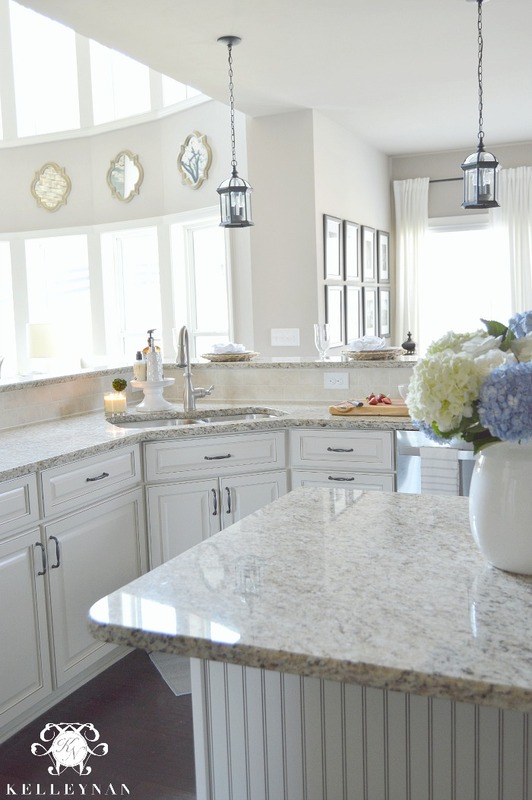 What a gorgeous Kitchen Kelley! 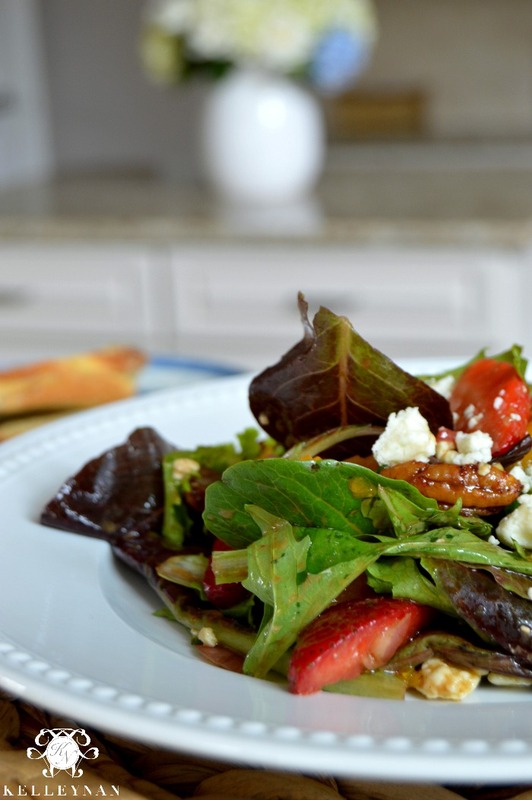 Love the little touches of Spring you added and I will definitely be trying your salad recipe…yum! Becky, thank you so much! I am still making my rounds but I LOVE your gorgeous blue accented patio! Your apps and drink make me wish it was patio time here RIGHT NOW! 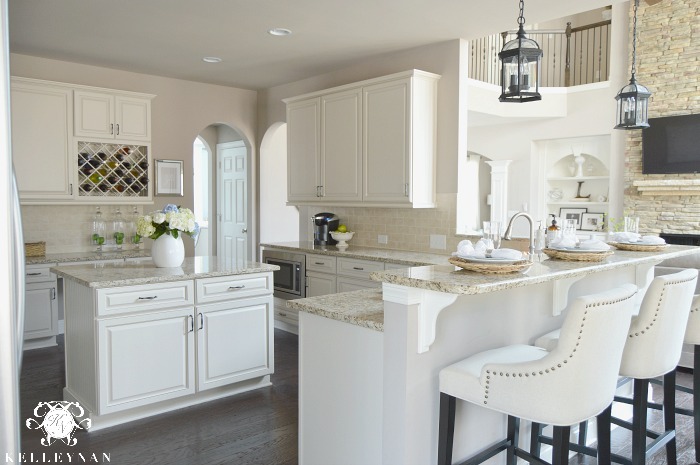 Love how neat your kitchen is! Beautiful. As soon as I get home I’m taking everything off my counters!!!! And maybe make that salad! Oh my! 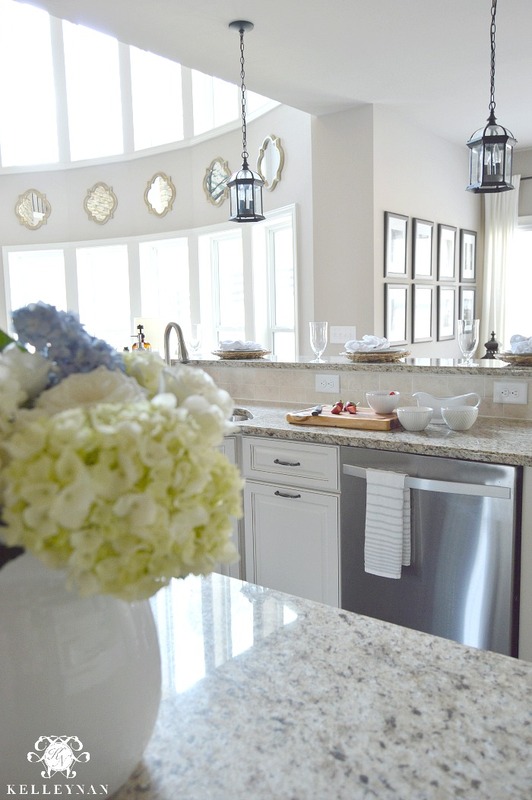 The kitchen, the butler’s pantry, the place settings, the flowers…Everything is wonderful! I love that you have included the special recipe as a bonus. 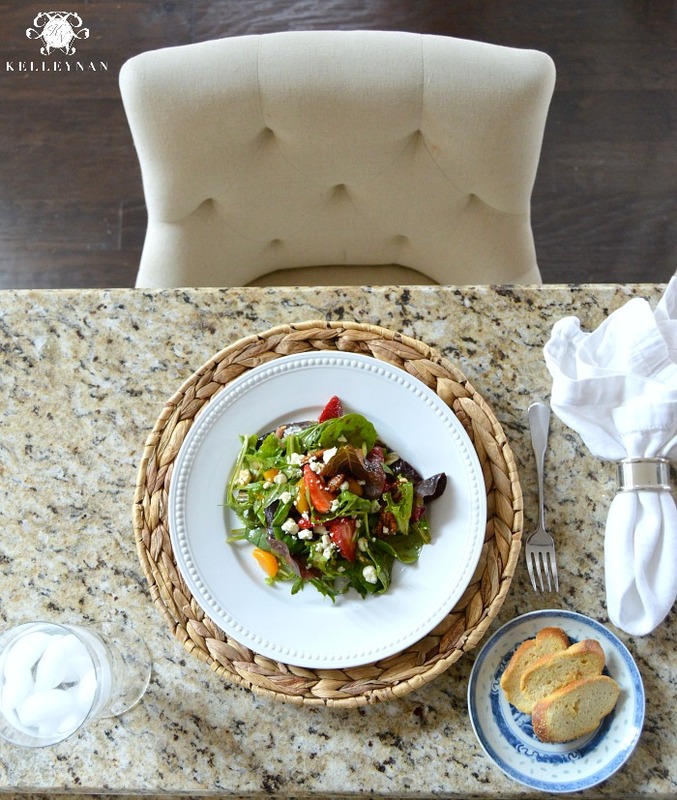 I must make the salad again soon–so perfect for now. I will also be trying out the pecan recipe. Love it all! 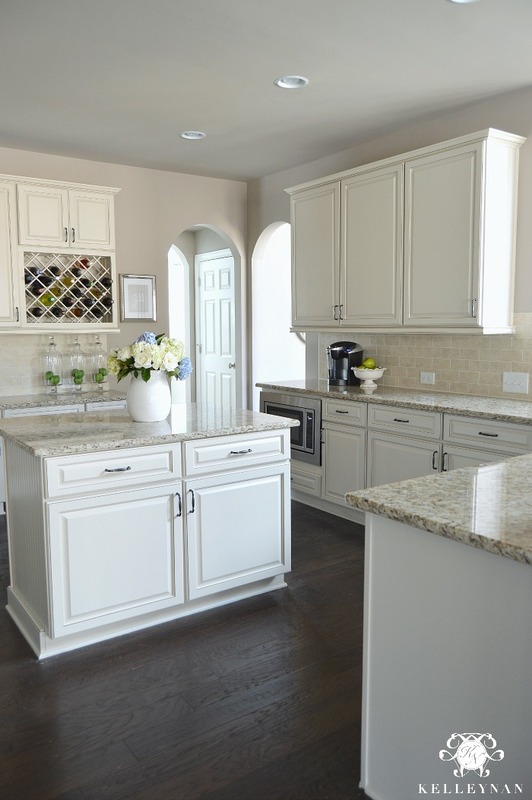 Your kitchen is beautiful Kelley! Your pictures are amazing and inviting! You’re a rock star! 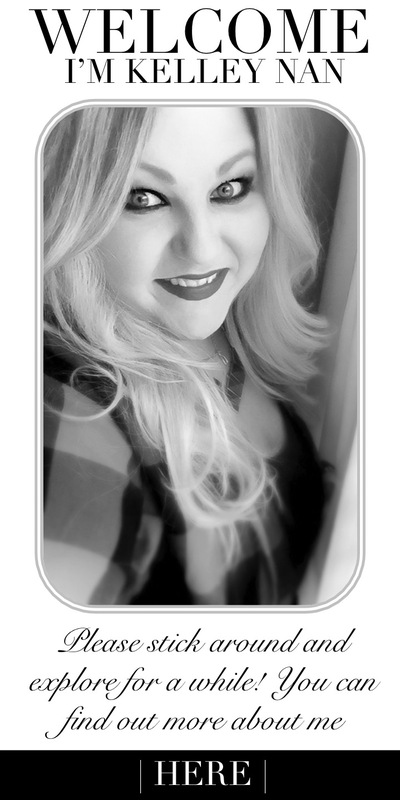 Bree, thank you! You inspired me with that yellow! And you must make the salad dressing; so so good! Wow Kelley!!! The salad look amazing! All of my favorite ingredients. Can’t wait to make it! 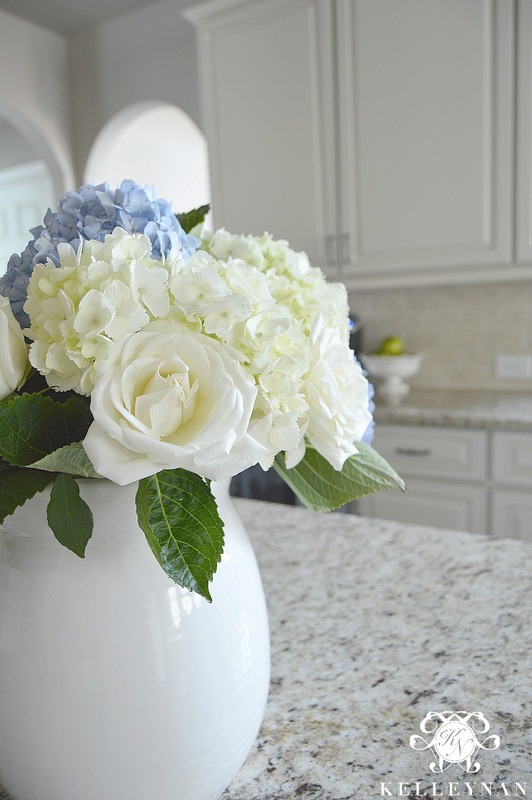 I alway love a tour of your kitchen and the blue and white hydrangeas with roses make my spring-loving heart happy!!! 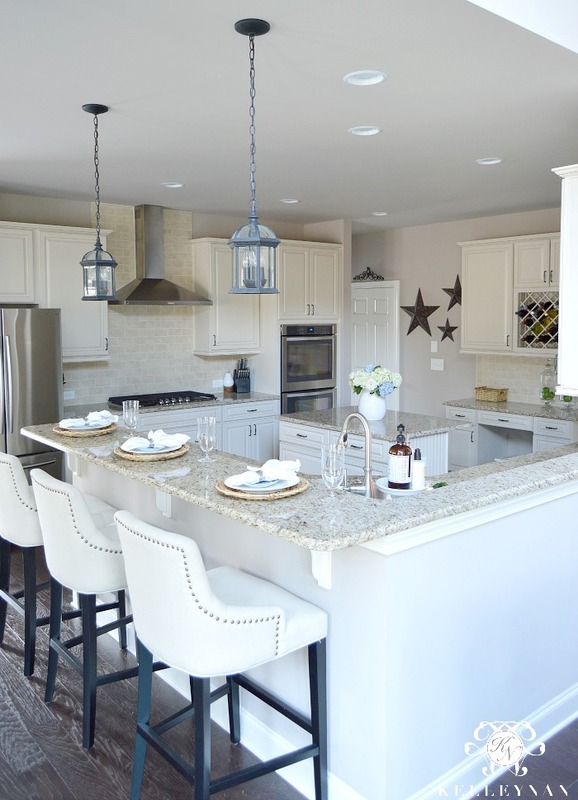 In complete love with your kitchen! What color are the walls painted? Sorry if it was somewhere in the post, but I searched twice and couldn’t find it. YUM!!! This looks so good, can’t wait to try it. I gotta a great summer salad I can’t wait to share with you soon!! I love your silver tray .. it would be perfect for my dry bar. Where did you get it? Thanks!